Red Crystal Diamonte / Diamante Stretchy Bracelet Beautiful clear almost gray crystal stones with diamonte spacers. The soothing energy of Rose Quartz fosters empathy, reconciliation, and forgiveness of others. Known as a romance stone, Rose Quartz can be used to attract love. The comforting and soothing energy of Rose Quartz can also help heal a broken heart, allowing release of pent-up emotions and grief. Sodalite brings inner peace. 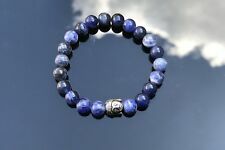 Sodalite is the stone of athletics, as it stimulates endurance. It is said sodalite will harmonize the inner being or the conscious and subconscious mind. Sodalite promotes peace and harmony. Green Glass Crystal Bead Threaded Elastic Adult Bracelet Set. Four elastic bracelets made with different shades of green glass crystal beads. Pretty, easy to wear bracelets which can be worn together or on their own. Moss Agate, Jade, Tigers Eye, Wooden beads and Tree Charm. Legendary as the Traveler's Stone, Moonstone is especially protective of those who travel by night or upon the water when the moon is shining. Moonstone opens the heart to nurturing qualities as well as assisting in the acceptance of love. 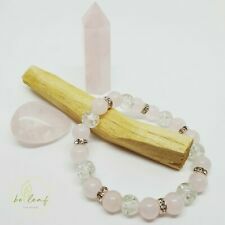 The Spirit Connexions 7 Chakra Bracelet is made with 8mm natural, un-dyed semi-precious gemstone beads. Grade-A quality stones have been selected for this Chakra Bracelet. What this means is pure, semi-precious gemstones with beautiful colours, with a solid feel and good weight Stones Used: Amethyst, Lapis Lazuli, Turquoise, Tigers Eye, Green Aventurine, Citrine, and Carnelian There are Hematite spacers separating the stones This bracelet uses 3 of each Chakra stone, meaning it is only available in one size of approximately 17.5cm circumference. If you did want this in a smaller size, I could use two of each Chakra stone and then add in some Onyx beads, if required. If you need it made larger then I could just include some Onyx beads. Contact me with your wrist size to check. Hand of Fatima or Hamsa with evil eye Protection With Frosted Crystal Quartz. It increases energy in general, and in particular the energy of all the other crystals. Therefore, at least in principle, it can replace any other stone. Beautiful handmade glass crystal bracelet. Black & White Glass Crystal Bead Threaded Elastic Adult Bracelet Set. Three elastic bracelets made with different shades of black and white glass crystal beads. Pretty, easy to wear bracelets which can be worn together or on their own. Turquoise and White Glass Bead Threaded Elastic Adult Bracelet Set. Two elastic bracelets made with faceted glass crystal beads. Pretty, easy to wear bracelets which can be worn together or on their own. Black Crystal Diamonte / Diamante Stretchy Bracelet. Beautiful black crystal stones with diamonte spacers. Black & crystal coloured Beads with black coloured Ribbon, Bracelet Trio. This trio of bracelets, are tied together with a pretty black chiffon ribbon and consist of 3 individual bracelets created from a mixture of sizes and shapes of Black and Crystal coloured (with hints of blue and green) beads. Natural gemstone for chakra healing / Reiki. Citrine chip bracelet. Genuine 7 Chakra Bracelet Reiki Healing Crystal Energy Natural Gemstone Yoga Zen. Condition is New with tags. Dispatched with Royal Mail 2nd Class Large Letter. Beautiful Clear / Gray Crystal & Diamonte / Diamante Stretchy Bracelet - NEW!! Clear / Gray Crystal Diamonte / Diamante Stretchy Bracelet Beautiful clear almost gray crystal stones with diamonte spacers. Frosted Crystal Quartz with Buddha Spacer bead. It increases energy in general, and in particular the energy of all the other crystals. Therefore, at least in principle, it can replace any other stone. I made it from complete natural stones and crystals which will match the colours of your Chakras. Every bracelet I make, I wear for an hour or two, energising for the eventual owner to find balance and healing. 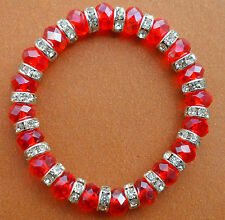 Red Glass & Swarovski Elements Bead Threaded Elastic Adult Bracelet Set. Three elastic bracelets made with faceted glass crystal and Swarovski Crystal beads. Pretty, easy to wear bracelets which can be worn together or on their own. The Spirit Connexions 7 Chakra Bracelet is made with 8mm natural, un-dyed semi-precious gemstone beads. Grade-A quality stones have been selected for this Chakra Bracelet. What this means is pure, semi-precious gemstones with beautiful colours, with a solid feel and good weight. ★ Genuine Semi-Precious Gemstones Amethyst, Lapis Lazuli, Turquoise, Tigers Eye, Green Aventurine, Citrine and Red Carnelian. All stones are genuine, we will NEVER use simulated beads. Crystal gemstone healing is based on the material being exactly that, Crystal or gemstone. If the bracelet were to use plastic, resin, or glass and lots of dyes, you aren't getting any healing benefits. There is a Hematite spacers separating the Chakra stones This bracelet uses 3 of each Chakra stone, meaning it is only available in one size of 7.25" circumference. Turquoise Glass Bead Threaded Elastic Adult Bracelet Set. Three elastic bracelets made with faceted glass crystal beads. Pretty, easy to wear bracelets which can be worn together or on their own. Main beads size: about 3mm. Mix all kind of natural crystal stones. Length: 14cm-20cm adjustable. Main beads size: about 3mm. Length: 14cm-20cm adjustable. Mix all kind of natural crystal stones. 4mm pearlescent white beads and multi coloured Czech AB crystals add sparkle to this spiral bracelet. Braided on a kumihimo disc to create this unique bracelet. It looks very elegant with pearls and sparkly bicone beads. Main beads size: about 3mm. Mix all kind of natural crystal stones. pealse be aware of this before placing your order.